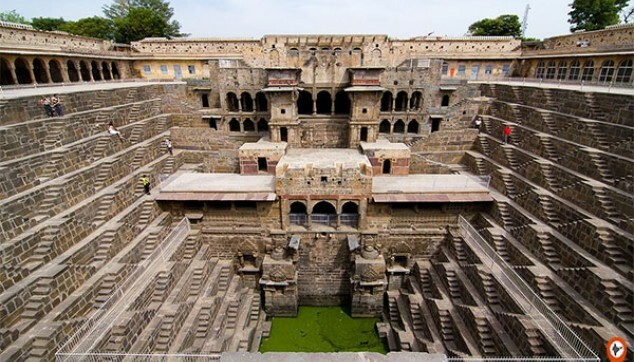 Excursion near Jaipur, This Abhaneri Step Well (Baori) tour package takes you to the most oldest Baori (STEP WELL) in Rajasthan, built by King Chanda (Chandra) of Nikumbha Dynasty who ruled at Abhaneri during the period of 8th and 9th Century AD. 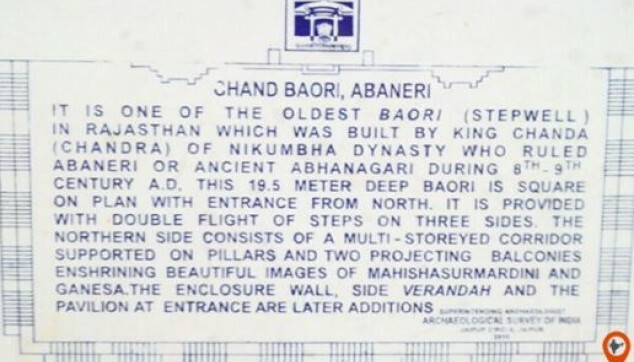 This 19.5 Meter Deep Baori is a square shape with entrance From North. It is provided with a dacouble flight of steps on three sides. The Northern side consists of a multi- storied corridor supported on pillars and two projecting balconies enshrining beautiful images of Mahishasurmardini and Lord Ganesha. Enclosure Wall, side Verandah and the pavilion at entrance are later additions. Private Abhaneri Step Well (Baori) tour from Jaipur. Explore the 13 storey deep Chand Baori. Have a delicious Rajasthani Lunch. Offer prayer to goddess of mirth and happiness. Acknowledge the structural brilliance of royal constructions. Taxi service from Jaipur to Abhaneri Step Well through air-conditioned car. Our representative will greet you in the morning at 9 AM and drive you towards the Abhaneri village for the Jaipur Abhaneri day tour. This village was discovered by Raja Chand who ruled Gurjar kingdom. This village is situated on Jaipur-Agra road and take 2 hours drive from Jaipur and famous for Temples and Baori. This Trip to the mysterious step wells of Abhaneri Chand baoritells you about the purpose for which it was constructed. Baori has huge step wells constructed to serve the purpose of rainwater harvesting. They also served as a centre for communal gatherings. These Baori reflect the talent and extraordinary skill of local people. 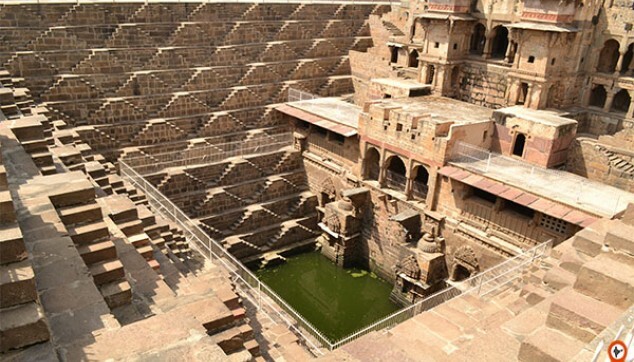 ‘Chand Baori’ is one of the famous Baori in Abhaneri village and is 13-storeys deep. It featured residence for royal families and a stage for performing folk art. Harshat Mata Temple devoted to the Goddess of happiness situated near Chand Baori. The temple attracts heavy pilgrim population throughout the year and washing hands and feet are compulsory prior going into the temple. After this, Same day Abhaneri chand baori tour, enjoy Rajasthani lunch at Local Restaurant. We return to Jaipur after completing our Abhaneri Baori Tour. Our representative will drop you at your hotel. Sightseeing with accompany English speaking tour guide. Jaipur to Abhaneri Transfer by Private air condition Car. we had an arranged stop at the Chand Baori, as I had read about it in a travel magazine and requested our Travel Guide have this included in the itinerary. Glad we did as it adds to the mystic and history of this wonderful country.